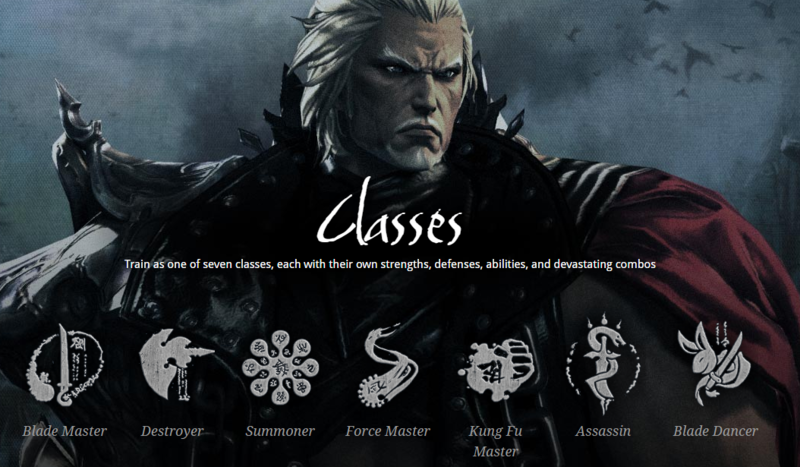 Typical stealth class with extremely fast paced, combo-filled combat considered one of the hardest classes to master. Very high single-target dps but are lacking when it comes to survivability and fighting packs of mobs. Due to huge reliance on complex combos you don’t want to play an Assassin if you have latency or performance issues. Very useful in parties, not only will it deal massive damage on bosses but also provides a damage buff. Assassins also have a very useful skill that forces stealth on entire party allowing to skip whole “trash pack” sections of dungeons. When it comes to PvP a good Assassin can burst you before you know what hit you, apart from high damage a skilled player will be able to keep you stunned for a long period of time. In short: Tanky - DPS. Blademasters have few abilities that allow them to sustain boss damage while dealing good damage. As a tank a Blademaster will always find a spot in a dungeon group. Among many useful damage mitigation skill, Blademaster can shield entire party from taking damage for a brief period of time. PvP-wise Blademasters are good for group fights, can sustain a lot of damage and still deliver some heavy punches. Just like Blademasters, Kung Fu Masters are a tanky class with decent dps. The difference between the two classes is that Kung Fu Masters really shine in PvP. The sheer amount of crowd-control skill this class has is simply staggering, a good player that knows how to manage his resources and cooldowns will be able to keep his target stunlocked throughout the entire fight. Considered one of the strongest classes overall in the game and most wanted class in PvE dungeon/raid groups. All of this due to one skill - Soul Burn. This skill sacrifices Warlocks pet - Thrall, and grants entire party huge boost to their damage, abilities, defenses, just like Assassin buff but few times better. Apart from this huge party burst, warlocks on their own can stay on top of damage meters throughout the entire dungeon. When it comes to PvP Warlocks used to be one of the weakest class but over the span of last few months it has become a really good in killing other players, not only Warlocks damage in PvP has improved but he can crowd control and kite you for ages. So if you really want a well-rounded high DPS class for both PvE and PvP i’d suggest a Warlock.